C.L. Engvall on Twitter: "Schoology information session for parents prior to Open House. Our students give awesome demonstrations! #ghscommunity @Schoology https://t.co/Dg2WuY4ssn"
Jen Bishop on Twitter: "Here are my choices for student learning & research log reflections... What questions do you ask? What would you add? Why? https://t.co/BJ0Z3g87SE"
Google Tricks and Tips: Image Search Tricks Every Teacher Must Know! EdTech Situation Rm on Twitter: "Ep 64: Talking #AppleEvent #iPhone8 rumors, Android on Chromebooks, podcasting renaissance, Bored & Brilliant, more! https://t.co/mljVHKcDfp https://t.co/5yC4kItXzW"
Parveen Kaswan, IFS on Twitter: "Fabric and embroidery map of India. Pashmina shawls to the Kanjivaram saree every artwork is unique and woven with love and pride. Our focus question for this year is HOW MIGHT WE? We even got temporary tattoos and stickers to help us keep this question in the forefront of our work during in-service days. Day 2 the question was: How might we use our collective strengths to improve teaching and learning? Teachers often ask for time to learn new tools that have come out during the year. 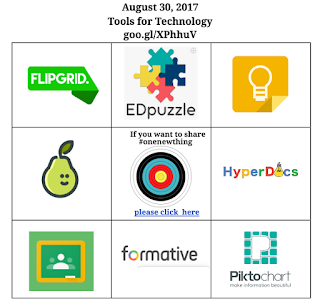 The team organizing professional development came up with 9 tools they thought teachers would want to know more about. Some, such as Classroom, has been in practice in some classrooms and others, such as FlipGrid were new. We also wanted to show teachers the idea of student choice. With our goal of using our collective strengths, I came up with a choice grid, based on a Hyperdocs template. There are 9 tools to choose from. Each square goes to an individual doc where a description of the tool, the room to meet in, some links, and the ability to take notes was available. Using the Edcamp model, I encouraged teachers to switch sessions if something wasn't working and to take notes so that other teachers could benefit if they missed a session. In the center of the choice grid is a link to share #onenewthing they learned or wanted to share. Casey Bell came out with a very timely article which fit perfectly as a take away for the activity: How to Push the Boundaries of School with Dynamic Learning. This activity was well received but we could have used about a half hour more for time. We will use it again later in the year. All teachers and students in the high school are getting new computers this fall. It's hard to believe, but this is starting our 12th year of being 1:1. I am always asked to kick off the in-service days with an update on what's new. Frankly, there are not a lot of updates anymore. I prefer to concentrate on how we're learning using the machines to help us. Over the summer I read Dan Ryder and Amy Burvall's book Intention: Critical Creativity in the Classroom. There are so many great ideas in it. They encourage remixing their activities. I also saw Lisa Thumann present #onenewthing at the EdTechTeam Custom Summit in Pulaski, Arkansas. Something that we have done in the past is to share a new idea using technology at faculty meetings. Either the principal or I would point out something we had seen in the classroom. The teacher would then do a quick overview. We called it "Geek of the Week" and it was modeled on the Seedlings podcast that I used to participate in. So I remixed "Geek of the Week" and a Lego activity and came up with #onenewthing. You will have 4 minutes to build something which I will tell you about in a minute. While building, you may trade Lego pieces with your partner, but it must be a one to one trade. You will have 4 minutes to build a representation of something new that you learned this summer. After the 4 minutes is up, Turn and Talk. Partner 1 - try to guess what Partner 2 made. Partner 2 then shares what they learned. Partner 2 - try to guess what Partner 1 made. Partner 1 then shares what they learned. Who would like to share one of their creations? Now let's think about our classrooms. What is #onenewthing you would like to try this year? Share with your partner. If you would like to show your creation - leave it on the table in the back. Instead of Geek of the Week, we are going to share #onenewthing at our faculty meetings. More to come! Andrew Wallace on Twitter: "Excited to be part of new multiple grade #STEAM project w #teachlibrarians techies and teachers focusing on school design #spsdme #edchatme https://t.co/Rn8sndZCbM"
"Using Named Versions in Docs to Track Writing Drafts"
STEAMPunksEdu on Twitter: "Here is example of a story centered problem based unit using VR and CSI! Feel free 2steal & use framework! https://t.co/LIhfaM1NFV #aussieED"
Trevor MacKenzie on Twitter: "Data we collect vs data we SHOULD collect. Where are you? #edchat #DiveintoInquiry #tosachat #aussied #ukedchat #edtech #edtechteam https://t.co/1vJ8HYiWaQ"